Even at 2,000 metres, there are several easy hiking routes. 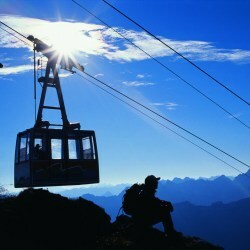 The Oberstdorf and Kleinwalsertal Valley cable cars make reaching them effortless too. Enjoy an unforgettable hiking holiday in Oberstdorf. You can book your summer lift tickets for free at arrival at participating hosts. You get all the tickets you need for the crossborder hiking region Oberstdorf / Kleinwalsertal Valley.